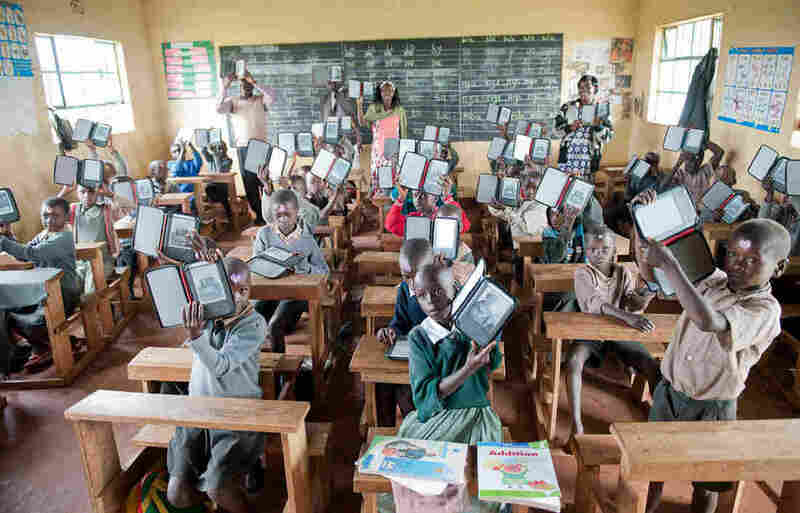 E-Readers Mark A New Chapter In The Developing World : Parallels David Risher, who helped Amazon become an online retail behemoth, has set his sights on a new frontier: global literacy. Using e-readers and cellphone apps, Risher's nonprofit, Worldreader, brings books to students in literature-starved communities. Students at Ntimigom School in Kilgoris, Kenya, show off their e-readers. Worldreader now operates in 27 schools and two libraries in Kenya. Risher was traveling around the world with his family when he got the idea for Worldreader. They were doing volunteer work at an orphanage in Ecuador when he saw a building with a big padlock on the door. He asked a woman who worked there what was inside, and she said, "It's the library." 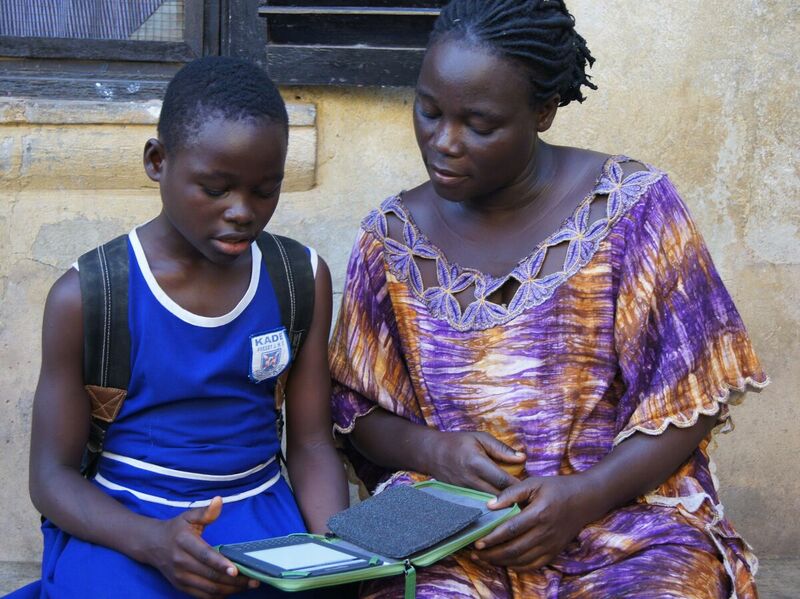 Deborah, a participant in Worldreader's iREAD project in Ghana, reads her favorite e-book with her mother. Worldreader has delivered more than 700,000 e-books via its e-reader programs. "I asked, 'Why is it locked up?' And she said it took too long for books to get there," says Risher. "[The books] came by boat and by the time they got there, they were uninteresting to the kids. And I said, 'Well, can we take a look inside? I'd like to see this.' And she said, 'I think I've lost the key.' "
This, Risher thought, can be fixed. If it's so hard to give kids access to physical books, why not give them e-books and the digital devices they would need to read them? Risher had joined Amazon at its beginning, helping it grow into the dominant online retailer it is today. He felt he could apply some of the lessons he had learned at Amazon to the problem of illiteracy. "We were really trying to change people's behavior, but once that started to happen, of course it took off because it was convenient and because the prices were lower," says Risher. "In a way, we are trying to do something very similar here. ... Here's a culture where reading has never really gotten a chance to take off because the access to books is so limited. So we make it easy for people to get access to books and we try to put books on the e-readers that are appealing to kids and interesting to teachers so that we can, over time, help people shift a little in their behavior and their mindset." 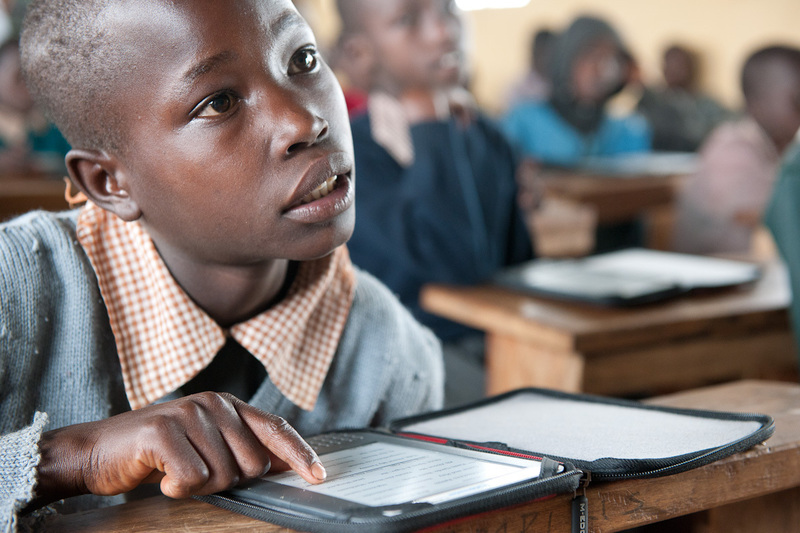 A student at Ntimigom School in Kilgoris, Kenya, uses his e-reader. "[E-readers] turn out to be remarkably well-adapted to the developing world, in part because they don't take very much power, they are very portable. It's almost like having an entire library in your hand and, like all technology, they get less and less expensive over time," Risher says. "We definitely found that it provided more access to materials. That wasn't surprising at all," says Bloome. "I think kids' appreciation and use of technology is somewhat universal in terms of the excitement — so much so [that] the kids would sit on their devices because they were concerned they would be stolen. And that led to one of the challenges we had in terms of breakage." Worldreader has responded to the breakage problem with tougher e-readers and training for students and teachers in how to handle them. Even with the breakage problem, though, the USAID study found the program to be cost effective. It also found that kids who had never used a computer before learned to use e-readers quickly and it didn't take them long to find games and music. But Bloome says that their excitement was contagious. Is Your E-Book Reading Up On You? "Especially with the group that was able to take the e-readers home, basically the young people became rock stars in regards to being able to introduce their parents or other kids in the community to e-readers," he says. "But really focused on content, which is really exciting. It's about the provision of reading materials." "It really is the best way to get books into people's hands where the physical infrastructure isn't very good, the roads are bad, gas costs too much ... but you can beam books through the cellphone network just like you can make a phone call — and that's really the thing that changes kids' lives." Risher says he knows Worldreader alone won't solve illiteracy, but he hopes it can be a catalyst for change.